Dog cakes come in all shapes and sizes! The most popular shapes seem to be the dog bone cake and the paw shaped cake. More and more dog owners are celebrating their dog's birthday, sometimes with an elaborate dog birthday cake from a dog bakery. We bring you some images of professionally decorated cakes for dogs. If you would like to order based on any particular bakery's work, just send us a note and we will be happy to put you in touch. Most of them do ship! This dog birthday cake for Vegas comes from the 12 Paws Barkery in Baton Rouge, LA, and is decorated with Fido's Frosting all natural yogurt dog treat frosting. Pay attention to colors and presentation. You have to please the human customers with eye catching cakes! This platter shows off paw shaped dog treats decorated with Fido's Frosting brand Royal Icing for Dogs, which dries hard and shiny as you can see. 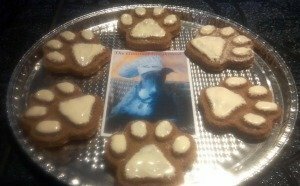 These paw shaped cakes are made by The Gourmet Greyhound in Houston, TX. This same shape can be used to make cakes for dogs cakes by baking the cake batter in a paw shape silicone cake pan. The image shows the 6 paw mold that works best for making little cakes for dogs. 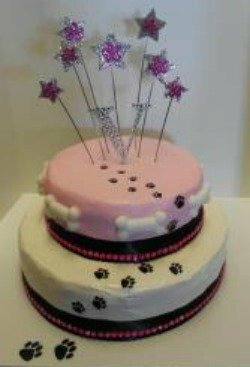 Have a dog party and serve each dog his or her own individual cake. The size is perfect for a individual cake, especially for smaller dogs with owners who feel that the regular size bone shape cake would be too large. 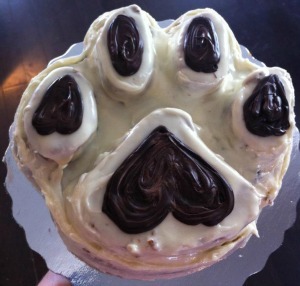 This dog birthday cake was made using the jumbo size paw shape cake pan sold by K9Cakery.com. This is a cheddar bacon cake for dogs made by Cheddar Dogs in Canada. This photo shows the silicone cake pan used to make this cake. The silicone pans are very easy to use. They do not require a lot of pre-greasing because if there is oil in the dough, it will pop right out when finished baking. The definition and nuances of the mold shows up well on the cake, making it easy to decorate. When you are all finished with your baking, you can simply put the silicone mould into the dishwasher and save yourself the time and effort of scrubbing. The silicone is very strong and the pan will not lose its shape. Make your dog party special with this dog bone balloon from K9Cakery. Add your own message!